According to the Cubs, the 100th anniversary of Wrigley Field was the “PARTY OF THE CENTURY,” but as far as I was concerned, it was an opportunity to snag commemorative baseballs. In fact, that’s the only reason that I flew to Chicago. I needed one of these balls, and it had to be a good one with perfect logo. 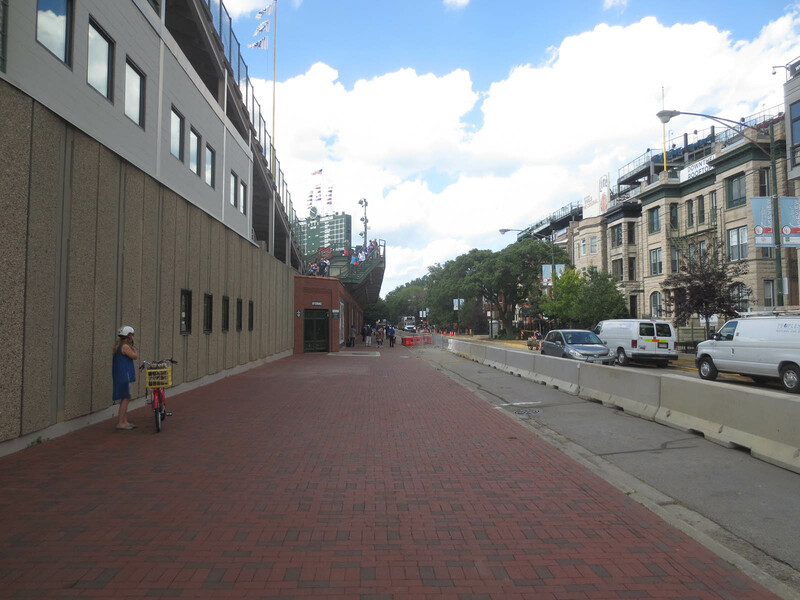 That’s the street that runs behind the right-field edge of the stadium. 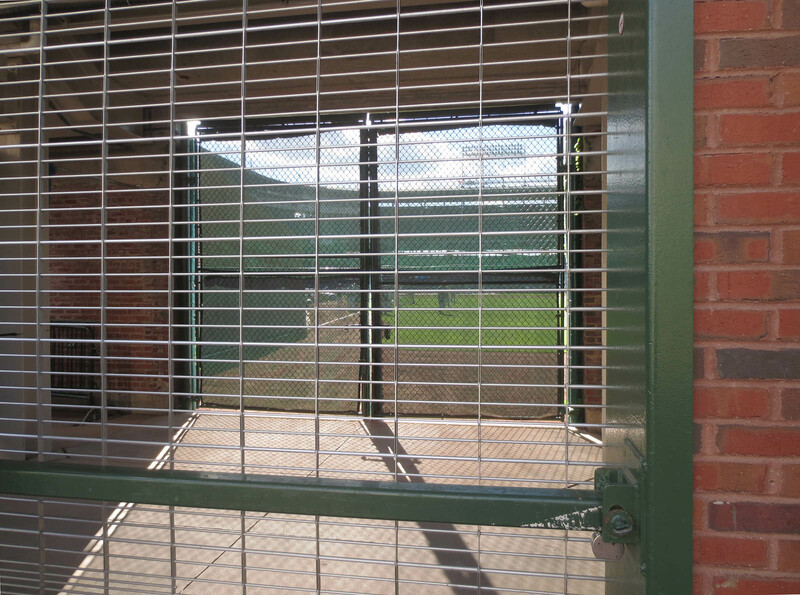 I enjoyed a sneak-peek inside through this gate . . . In the photo above, did you notice the guy standing in the shade on the sidewalk? That’s Rich Buhrke, one of the top ten ballhawks of all time that I featured in my latest book, The Baseball. (See pages 273-274.) It was great to see him, and while I was there, I also ran into Moe Mullins (pages 271-272) and another very accomplished ballhawk named Dave Davison, plus a newer ballhawk buddy named Kenny Kasta, whom I’d met last year in Milwaukee. Unfortunately I’d gotten there a bit too late and had missed the few balls that reached the street, but it was still great to catch up with these guys. Did you notice the concrete barricades in the previous two photos? 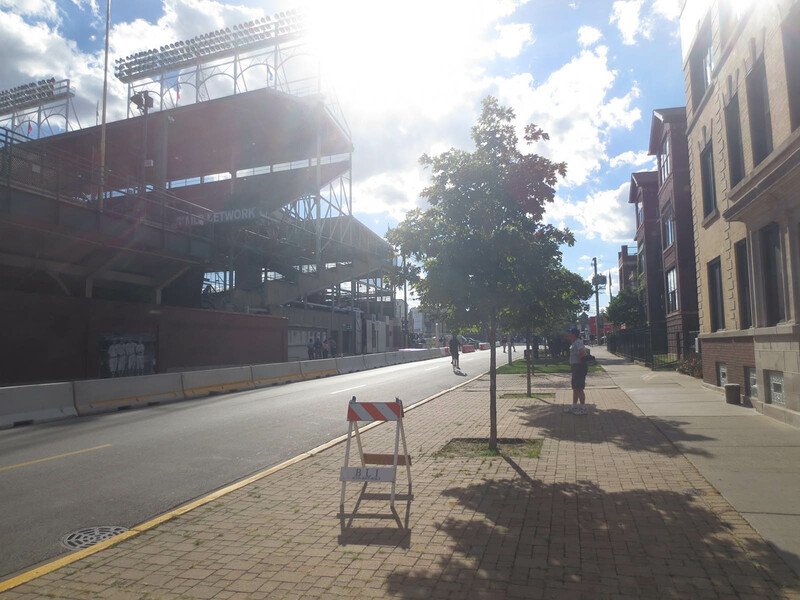 Supposedly, when the bleachers are expanded yet again this offseason, that’s how far out into the street the stands will extend, and to make matters worse, there’s going to be a HUGE video screen with a ton of advertisements erected at the top of the bleachers. What a disaster. When the stadium opened at 5:05pm, I raced to the bleachers, hopeful of getting a head start on the competition. 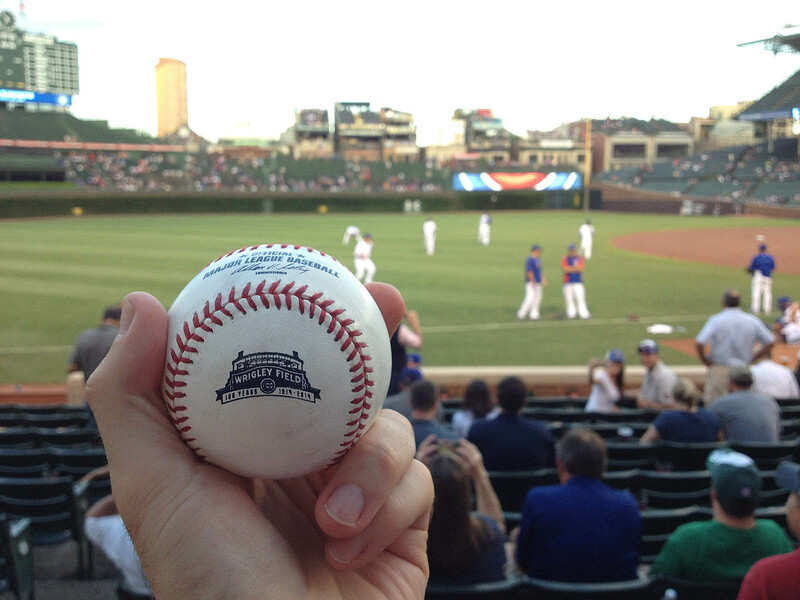 I’d heard that *all* of the Cubs’ BP balls were commemorative, so I really wanted to get my first one quickly. So much for that. Not only did I fail to snag a ball within the first 10 minutes, but Brandon got one without even trying. 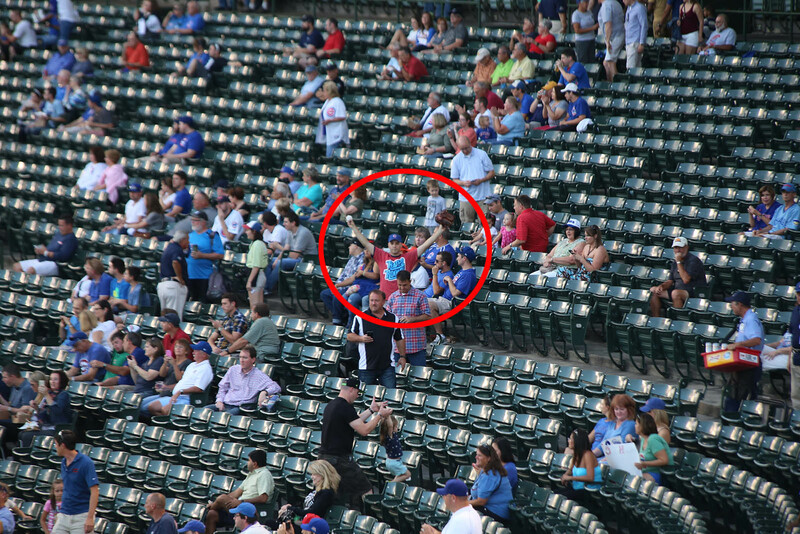 He was filming me from the back of the bleachers when one of the Cubs crushed a deep home run that landed near him. He scurried over and picked it up, and when I asked him if the ball was commemorative, he shrugged. GAH!! 1) Two other fans were converging on the spot where the ball was going to land. 2) A woman who was sitting there ducked and leaned to the side. 3) I made a lunging back-handed catch and nearly tumbled onto her. I’d been hoping and trying all season to snag one of these balls, and now I’d finally done it. When the Cubs had visited Yankee Stadium in April for a two-game series, the first game got rained out, and I skipped the day/night doubleheader the following day. When the Cubs went to Philadelphia in June, the weather was terrible on my one free day, so I skipped that as well. 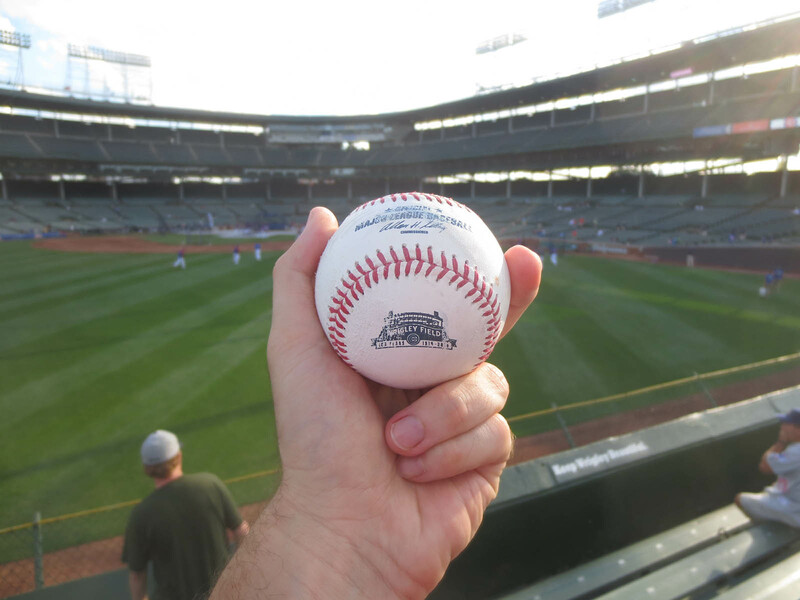 When the Cubs played a four-game series last month at Citi Field and *didn’t* bring a single commemorative ball with them, I had no choice but to book a trip to Wrigley if I wanted to catch one . . . so you can see why I was so excited. He was partially right. Although I had snagged a commemorative ball, the logo *was* slightly messed up — and what I really wanted was a game-used/mud-rubbed ball with a pristine logo. 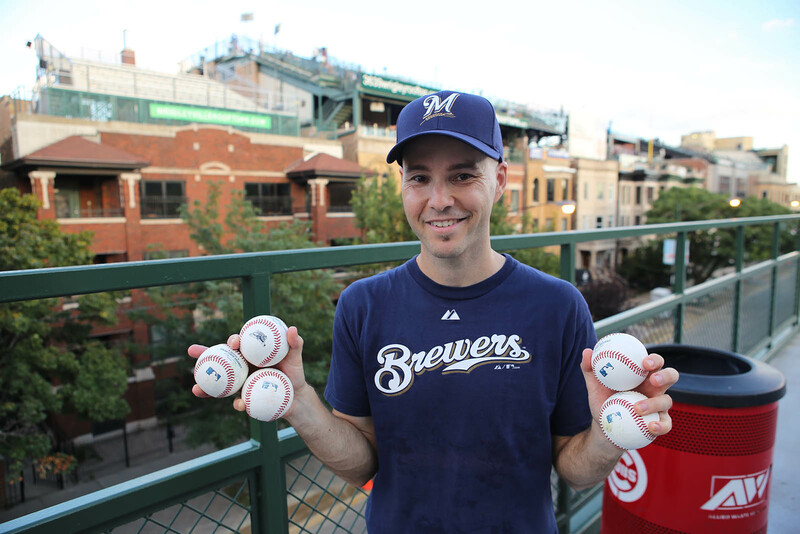 From a numbers standpoint, the Brewers’ portion of BP was better, but none of the balls were commemorative. Here’s what it looked like in the bleachers . . . The ball pictured above — my 2nd of the day — was tossed by a player that I didn’t recognize. My next three baseballs were home runs to left field, starting with a line-drive shot that I caught on the fly in the 2nd row. I had to drift down a couple of steps for that one, and it didn’t get any easier from there. My next ball was a deeper line drive by Mark Reynolds that tipped off the end of my glove as I lunged all the way down for a back-handed catch. Thankfully it stayed at my feet and I was able to grab it. My final home run landed several rows deep in left-center and resulted in an all-out scramble. By the way, Brandon filmed all of my catches, so there should be some good, action-packed footage in the video. 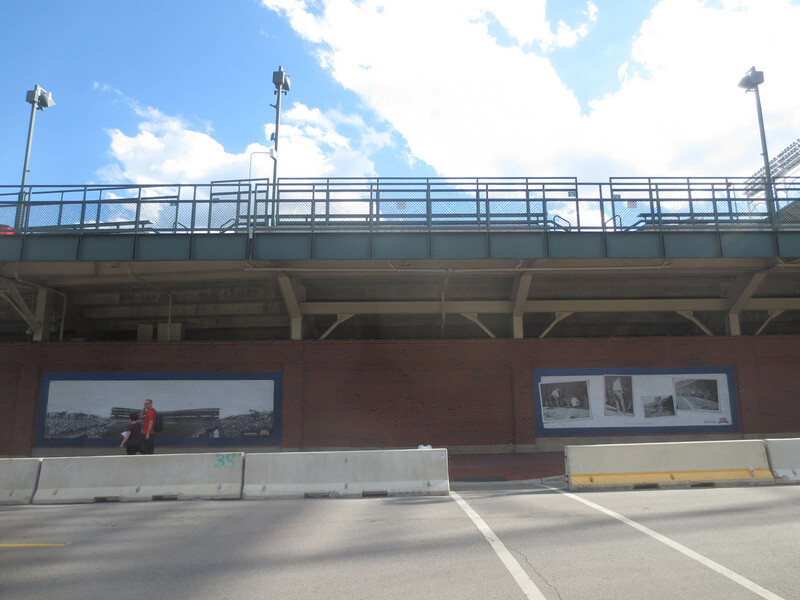 Do you remember the guy named Kenny who’d been out on Waveland Avenue? Well, he was inside the stadium for BP and gave me a valuable piece of info. He told me that everyday at around 6:45pm, Cubs pitching coach Chris Bosio throws half a dozen baseballs into the left-field bleachers. Kenny added that several of the balls usually get thrown to the regulars, but the rest are up for grabs. I promised that I’d keep my distance from him, and when the time came, I picked a random spot in straight-away left, roughly two-thirds of the way toward the top. 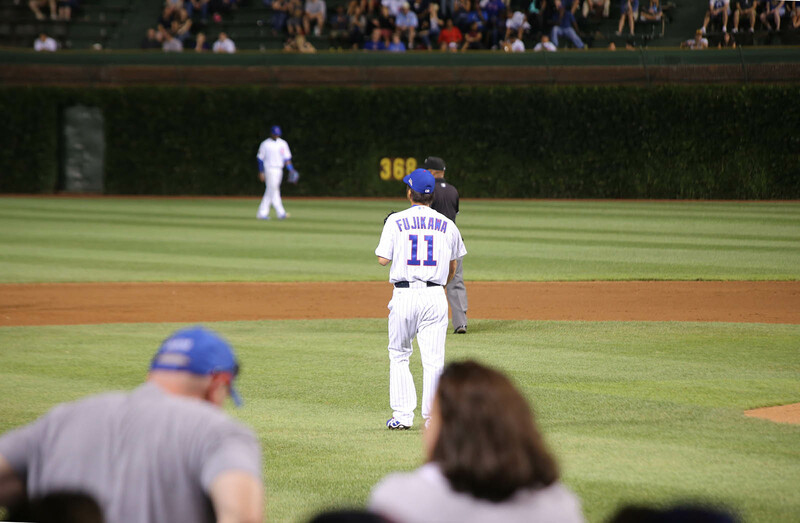 Sure enough, Bosio strolled out with three balls in each pocket and soon began chucking them all over the place. 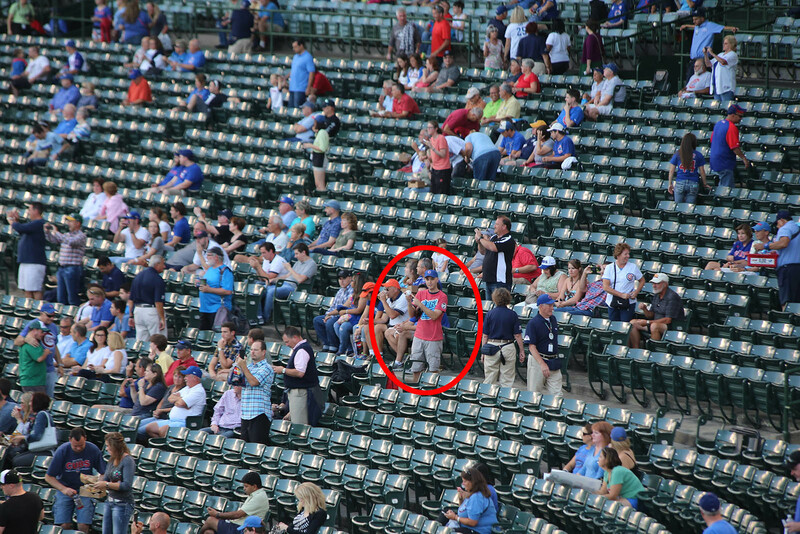 After the first few balls went to fans who were nowhere near me, Bosio threw one 30 feet to my right. Naturally I started running in that direction in case there was a bobble, and here’s what happened: the ball sailed *way* over the head of the intended recipient, nearly hit an oblivious fan who was sitting in the last row, and smacked off the back fence. As it started bouncing down the steps, I cut across and swiped at it with my glove, scooping it up like a 1st baseman handling a short hop. It was beautiful . . . and the ball was commemorative! But the logo wasn’t perfect, so my mission continued. 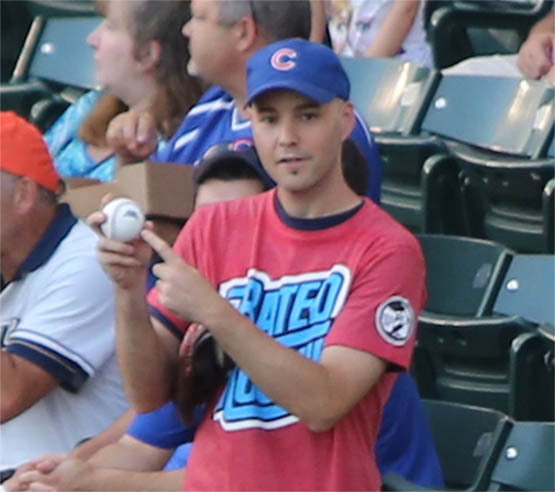 Several minutes later, I shifted over to the cross-aisle behind the dugout and got Starlin Castro to throw me a ball, and moments after that, in nearly the same spot, I got the attention of Javier Baez and got him to lob one to me. Both of these balls were commemorative, and my total for the day had reached nine. 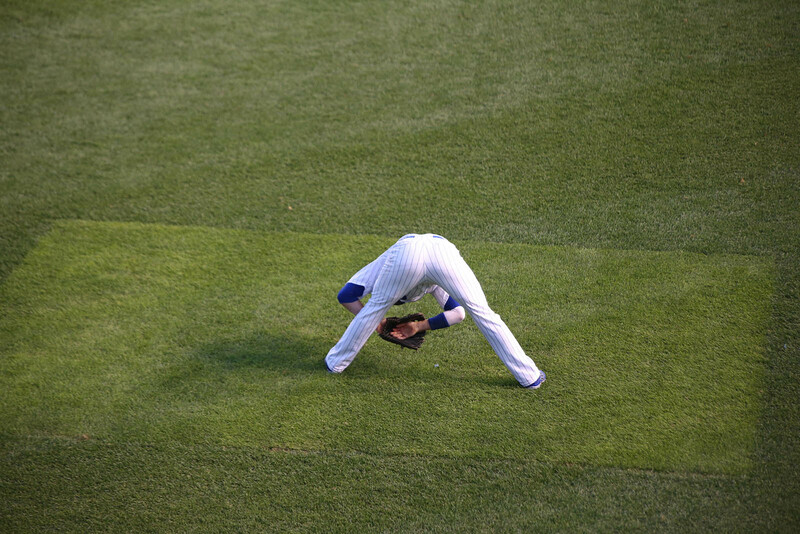 Brandon stayed in the bleachers for the start of the game and took a bunch of photos, including this . . . I didn’t know it at the time, but Brandon wandered from the bleachers into the main part of the stadium. 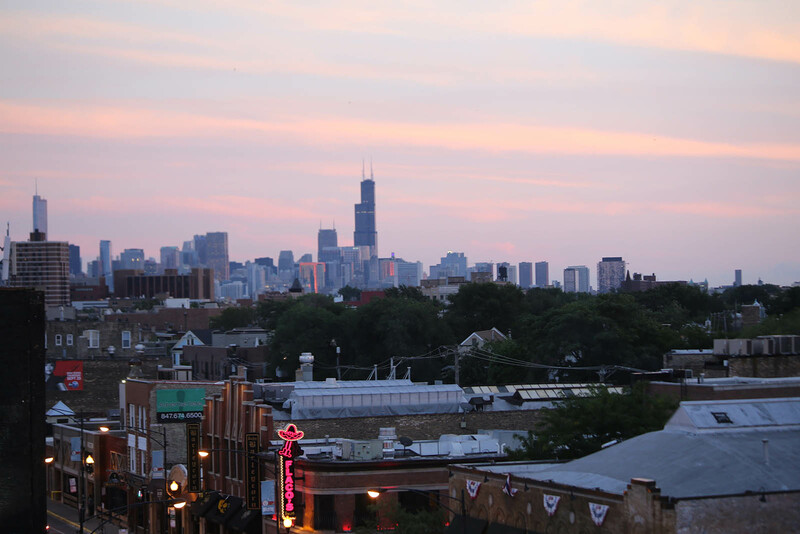 Here’s a photo he took of the Chicago skyline . . .
Gorgeous. That’s really all there is to say. After a couple of innings, I made my way to the 1st base side . . .
. . . and ended up moving a bit closer. The ushers were super-protective of the seats between the dugout and cross-aisle, but they didn’t seem to care about anything past that, so I sat directly behind the aisle. In the bottom of the 4th inning, Chris Valaika hit a sinking line drive at Brewers shortstop Elian Herrera, who caught it . . . or did he trap it? Even he didn’t know, so he fired the ball to 1st baseman Lyle Overbay, who scooped the short hop. It was a bang-bang play. The runner looked out, but the ump called him safe, and the Cubs challenged. At that point, Overbay looked toward the stands, and I knew right away that he was looking for someone to throw the ball to, so I jumped up and waved my arms and shouted his name, and he threw it right to me! His aim was perfect! It barely cleared the outstretched arms of the folks in front of the aisle. The ball had a huge, infield-dirt scuff, but it was nowhere near the logo, so now my mission had truly been accomplished. Fast-forward four innings. A rookie named Matt Clark had replaced Overbay, and when the 8th inning ended with a routine groundout, I drifted down several steps from the cross-aisle and got that ball too . . . except not really. As some 1st basemen do, Clark switched balls on his way to the dugout and tossed me a non-commemorative infield warm-up ball instead. BAH!! But hey, it was better than nothing. In the 9th inning, I met up with Brandon and headed over to the cross-aisle behind the home-plate end of the 3rd-base dugout. On a previous visit to Wrigley, that’s where the umps had exited, so it was the obvious place to try to snag one more ball. Okay, so . . . when Rickie Weeks went down swinging to end the game, I hurried down to the dugout, only to see the umps walking the wrong way! WTF?! They were all heading to the 1st base dugout! Obviously there was no chance to run over there and catch them on the way in, so I held my ground and ended up with something even better. Behold! That’s right. 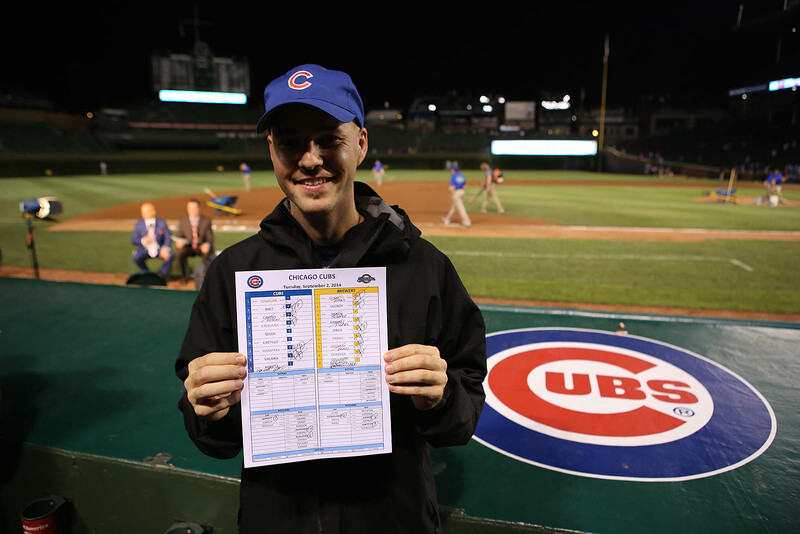 One of the Cubs’ coaches gave me the lineup card. Initially, on his way in, when I asked him for it, he said no and disappeared from sight, but 10 seconds later, perhaps after asking the manager and/or winning pitcher if they wanted to keep it, he poked his head back out and slid it to me across the dugout roof. 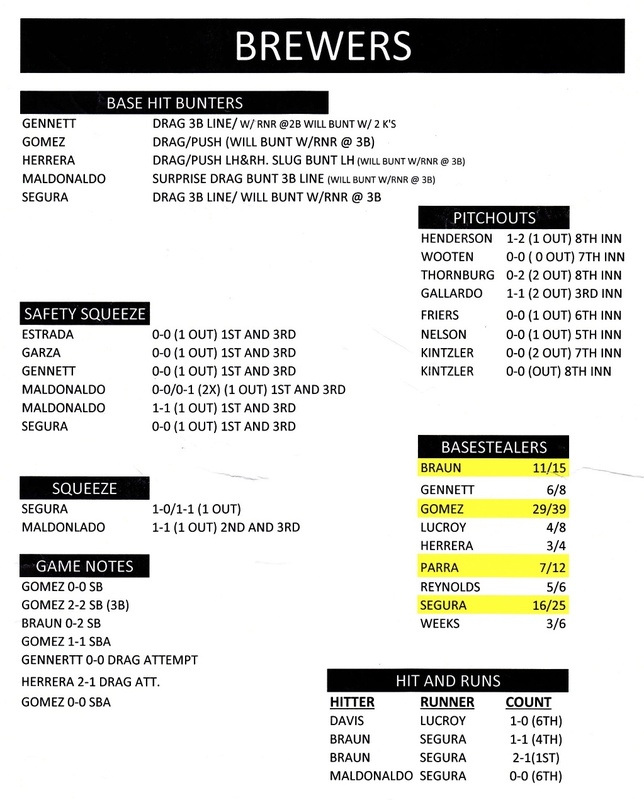 I’ve gotten dozens of lineup cards over the years, some of which have included various bits of info on the back — stuff like the ground rules and pitcher usage charts and biblical references — but this was a first. And I don’t fully get it. Take the “PITCHOUTS” section, for example. 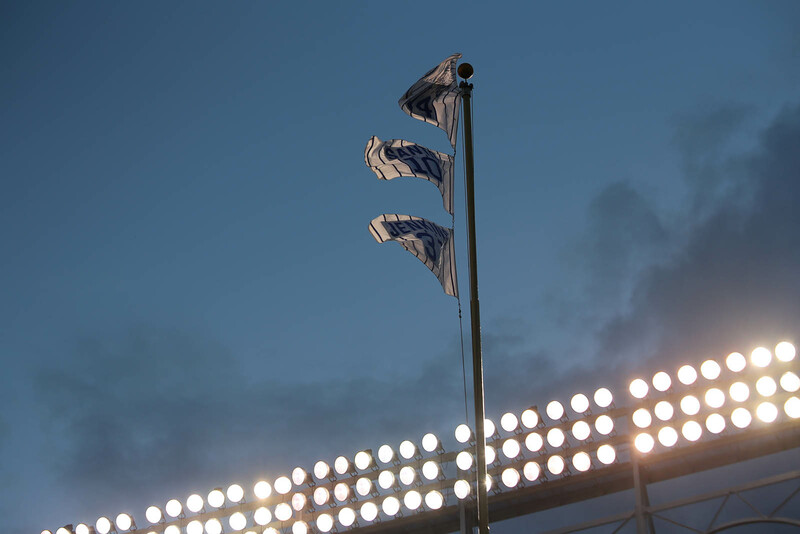 Are those the pitchouts that the Brewers have thrown against the Cubs this season? It’s fascinating to get a glimpse of the inner/strategic workings of a Major League Baseball team. You know what? It’s just as well that the Cubs didn’t bring their precious balls to Citi Field last month because if they had, I wouldn’t have gone to Chicago, and I would’ve missed out on this incredibly fun day at Wrigley Field. • 467 balls in 68 games this season = 6.87 balls per game. 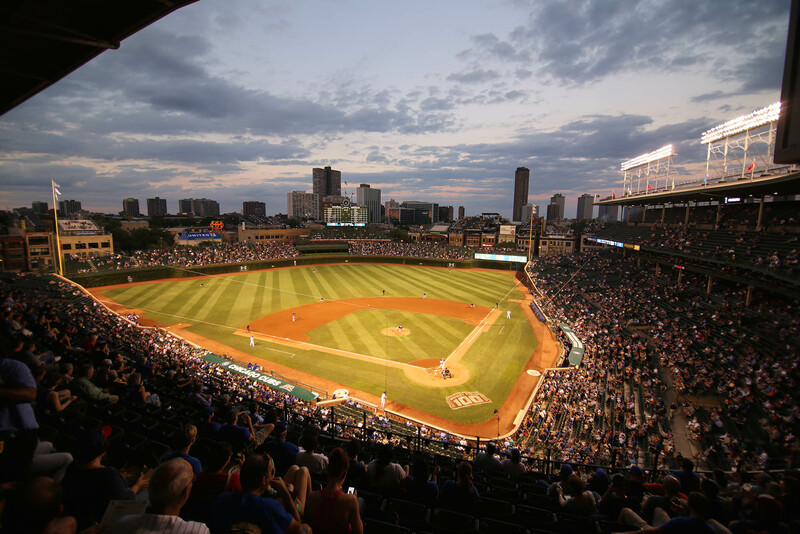 • 58 lifetime balls in 8 games at Wrigley Field = 7.25 balls per game. 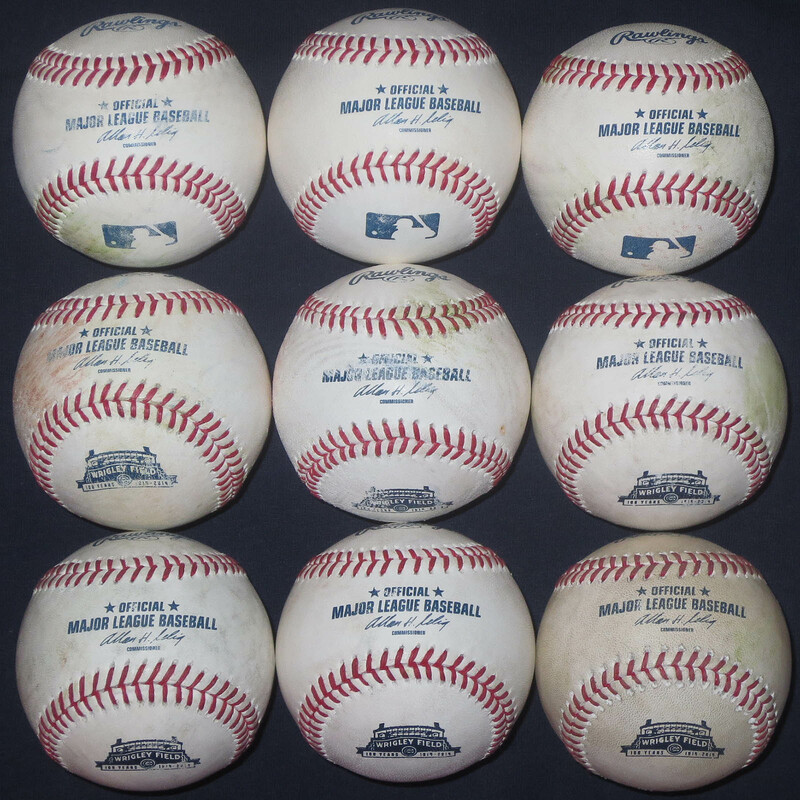 • 64 different commemorative balls; click here to see my entire collection. 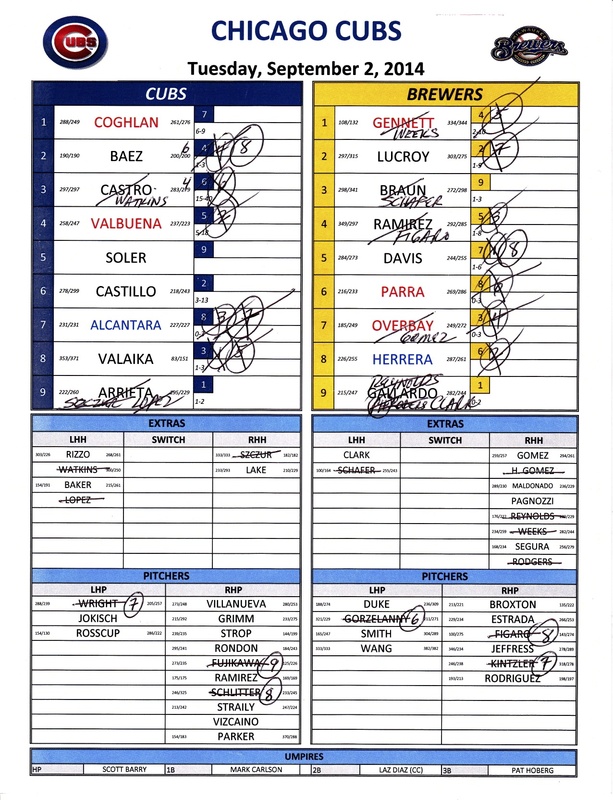 • 37 lifetime lineup cards (or pairs of lineup cards); click here to see them all. Great job! Looks like you had a great day. 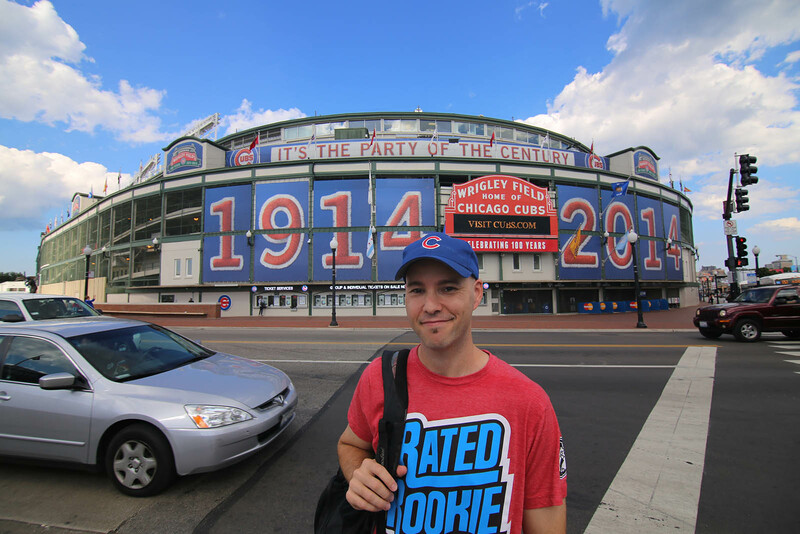 I’m actully on my way to the Cubs game right now, to try and get some of the commeratives. Wish me luck! Those commems are nice! I’d just like to state that the “PARTY OF THE CENTURY” was held two years ago at Fenway Park. Sorry Wrigley. Nice Zack looks like you did well. It was awsome to meet you! Only YOU would get rewarded for not remembering when I told you in an e-mail that the Umpire tunnel had moved to the middle of the 1B dugout. That’s got to be the coolest lineup card I’ve seen. Good stuff. Also, it makes it sound as if the Twins rep basically tells fan that their ball is worthless and they might as well give it up since if it is not authenticated nobody will give them much for it. No place does it mention whether or not they will authenticate an item and then give it back to the fan. If they don’t than that it lame. 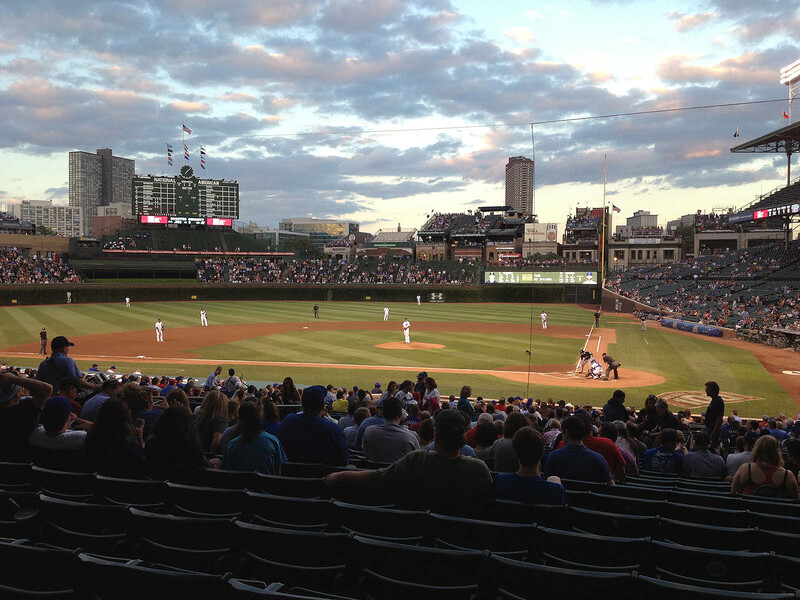 What a great day at Wrigley. 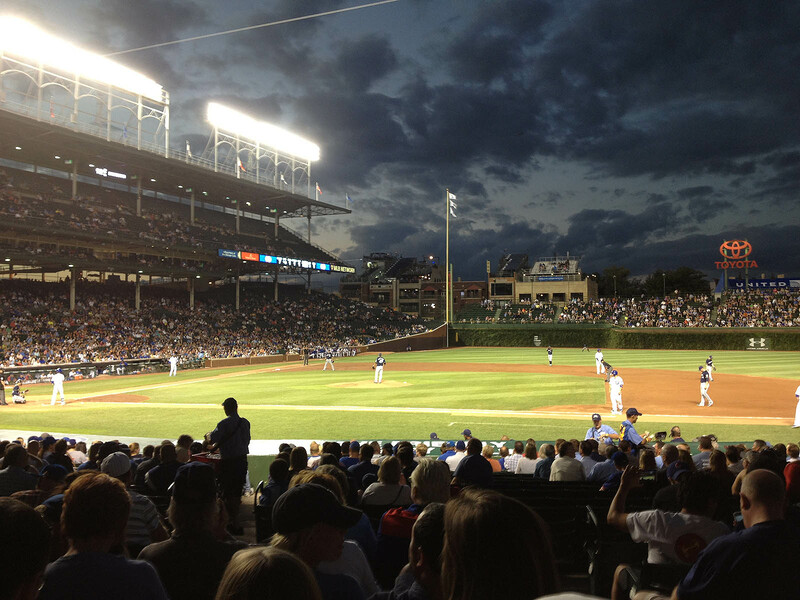 One of my favorite ballparks, not that I have been to all that many. The fans are friendly and welcoming. My husband and I bought SRO tickets, then plunked down in a couple seats in RF. The two gentlemen who had the actual tickets for those seats showed up and let us keep them. They sat a row behind us. How nice is that? I am very disappointed about the “improvements” to the bleachers. Silly, really. I am looking forward to the new scoreboard. Have you ever gotten an item authenticated and handed back to you? Any post season plans this year or will it all boil down to the teams involved? The video is done, but it didn’t seem to convert properly on my computer, so it’s all weird and choppy. As soon as I figure out what’s wrong, I’ll post it, but I’ve been so busy that it might take a few days. I hope it went well. Let me know how you did, if you get a chance. I did indeed say hi on your behalf . . . and I know what you mean about wanting to catch one yourself. People often offer to trade balls with me, and I have *NO* interest. Might as well go and buy a ball if you don’t care about how it was obtained. Looks like I’ll be seeing you in a couple of weeks. Thanks. Very nice meeting you too. Sometimes I’m dumb, and sometimes I get lucky. It seems both things happened here. Interesting stuff about authentication. I had it happen once. That was the last Mets homer ever hit at Shea Stadium. Soon after I caught it, I started screaming for an authenticator, and a supervisor who knew/liked me tracked one down. As for the playoffs, I have no idea. Maybe Baltimore. Not sure about anywhere else. I’m pretty worn out right now, so it’s hard to think about going anywhere next month. That’s absurdly nice. 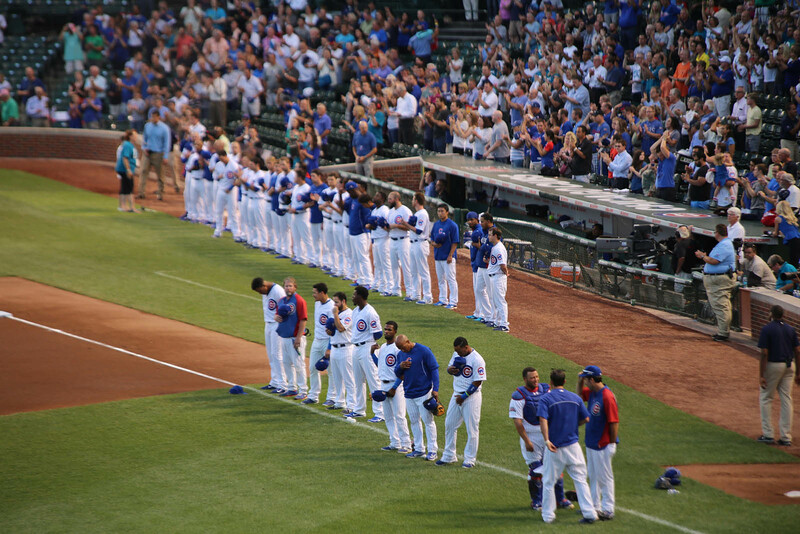 They don’t call it the “friendly confines” for nothin’. That *is* weird — kinda looks like a barcode. I would love to know why. I knew you still weren’t satisfied…but I wanted to take it easy on you. Great post Zack. Good job on the commemoratives. Nice camera work too. I have to ask though , where are the food critiques ? Love the line – up card notes. Sigh , I really miss the atmosphere at the game !! Watching it on TV is good but nothing like being at the game. I`m definitely living in the wrong country. At least for the MLB season. You mentioned that the Cubs didn’t bring Wrigley balls with them to NY last month, and I was at an Orioles @ Red Sox game on 9/9 where there were no Orioles commemoratives to be found during warm-ups / BP. Are they trying to force people to come to their ballpark to have a shot at getting one, or is there any other reasoning behind not bringing the commemoratives on the road that you can think of? Thanks! You know me very well. Thanks for the heads-up. I’ll do my best, but I think the teams will want to keep their lineup cards. Great to hear from you! But you’re right — you ARE living in the wrong country. I know I’ve been slacking on the food critiques. I just haven’t been eating much at stadiums lately. Had some amazing deep dish pizza on September 3rd in Chicago, and yes, I have pics, but that was the first thing I did that day, and it seems weird to start a blog entry with that. yeah i was at a White sox Orioles game and looked down in to the bullpen bag and saw a commemorative ball would’ve helped if i had Orioles gear. Thanks! Got a bunch last night at Yankee Stadium. 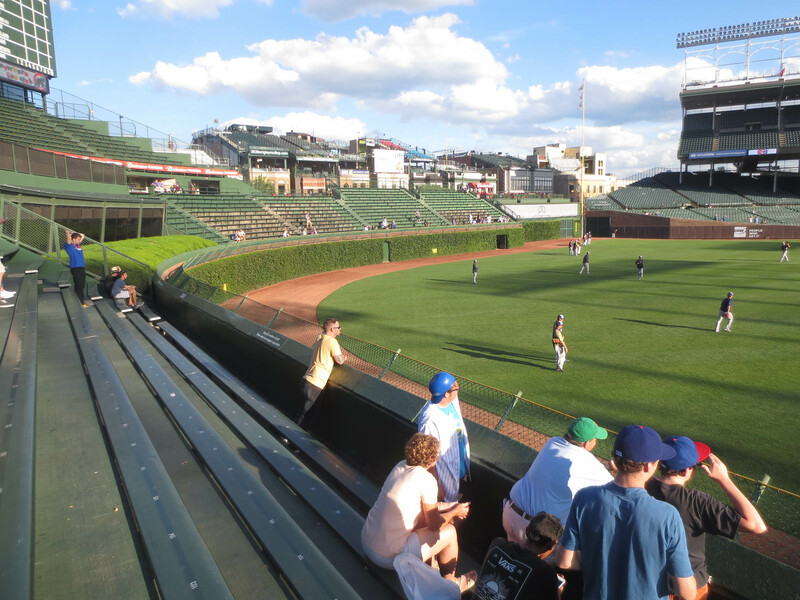 Nothing like the bleachers at Wrigley Field. Too bad they’re shut down this season. I wonder how many balls are still stuck in the green ivy in the outfield? Probably not too many. I’m sure they clear ’em out every so often, and this time of year, when the ivy isn’t yet in full bloom, I would imagine that balls are much easier to see.